Without a doubt, Weebly offers you one of the easiest and quickest ways to create your website whether for business or pleasure. Is the free plan enough or will you have to cough up for one of the premium plans and if so, which plan will suit you best? The last thing you want to do is end up paying more than you need to right? With that said, let’s go and take a look at each of the Weebly plans. Alternatively, you can read my full Weebly review here. **Prices shown are in US dollars. To see full plan breakdowns and prices in your currency, head over to the Weebly pricing page. Is Weebly’s Free Plan Really Free? Yup, it’s really free but as with the majority of website builders, the free plan is not meant for an all singing, all dancing site due to many of the features being restricted for paying members which is fair enough. Instead, it’s a way to test things out and decide whether Weebly really is the best platform for you. When you create your free account, you’ll be given a free web address (domain name) that includes the Weebly branding. The other major thing to note here is your website will have a Weebly advertisement at the bottom of your site but to be honest, it’s fairly subtle in comparison to some of their competitors. As well as for testing purposes, I think the free account option would also be suitable for a personal or hobby site or maybe even a website for the local kids’ football team etc. The Starter plan is one step-up from the free plan and while there are differences between the two, there aren’t many. 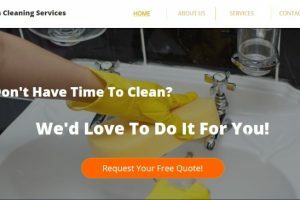 The first thing to note about the Starter plan is that you won’t have to put up with Weebly ads which will go a long way to making your site look a lot more professional. Next, you’ll have the option to connect your own domain name to your website which doesn’t contain the Weebly branding (you can purchase your own inside Weebly or bring over one which you already own). If you decide to sign up for the annual or two year plan, they’ll throw in a domain name for the first year saving you an additional $20. You’ll also have the option of adding a store to your site and be able to sell up to 10 products although you will have to pay a 3% transaction fee on any sales. Unfortunately, the store will be lacking essential features such as the shipping and tax calculator as well as inventory management. You also won’t be able to sell digital products. Starter Plan may be for you if; You want to create a fairly basic, yet professional looking website without any of the bells or whistles. One of Weebly’s standout features is that they allow you to create a membership site and the Pro plan is where you’ll get your first sniff of being able to do. You’ll be able to password protect certain pages and have up to 100 members. In addition, you’ll get everything you do with the Starter plan, you can sell up to 25 products, your visitors will be able to search your website and you’ll be able to display high-quality audio and video. Pro plan may be for you if; You looking to create a website to showcase your business but do not intend on selling much. Also if you wish to use a lot of video and audio, or require the ability to password protect certain areas of your site. The Business plan for those who are serious about starting to sell physical or digital products online. **Note: Digital products carry a 3GB file size limit. With this plan, you can sell unlimited products with no transaction fees and get access to tools that were previously restricted such as shipping and tax calculators as well as inventory management. You’ll have access to everything in the Starter and Pro plan and be able to create a membership site with unlimited members. The business plan may be for you if; You’re serious about creating a digital store and selling either physical or digital products online. Also a good option if you want to create a large membership site with unlimited members. In addition to previous plans, you’ll have access to real-time shipping rates (US, Canada, and Mexico only), as well as an automatic tax calculator (US only). You’ll be able to send automatic emails to customers who’ve added items to their cart and then abandoned it, as well the ability to offer digital gift cards to your customers. The Performance plan may be for you if; You have eCommerce experience and you require the advanced tools to help take your store to the next level. When you sign up to one of the premium plans, you’d be forgiven for thinking that’s all you have to pay. Let’s take a quick look at each of them so you know what to expect. #1 Domain name (web address): You have the option of purchasing your own web address though Weebly that will look something like yourwebsitename.com. If you choose a monthly plan, the cost of the domain name through Weebly will be $20 per year. If you choose the annual or two year plan, Weebly will throw in a domain name of your choice for the first year. After the years’ up, it will be up to you to pay the renewal fee. If you already have a domain name that you own, you can bring it over and connect it to your site. #2 Personalized email address: There are very few website builders that actually have an in-house solution for an email address that matches your domain. 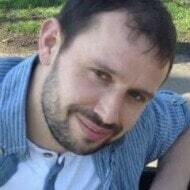 For example, contact@yourwebsitename.com (Jimdo is one of the few that does). To be able to offer this feature to customers, Weebly has partnered up with Google where you can grab a business email through “G-Suite”. The drawback is it’ll cost $4.08 per month (billed annually) but you can get a 15-day free trial which is never a bad thing. 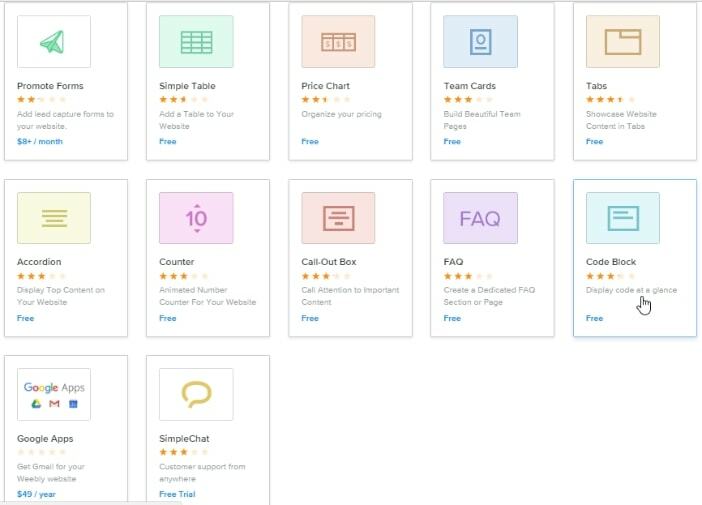 #3 Add-ons from the Weebly App center: The final pricing consideration is when you start adding features to your site from the Weebly App center. Some of these add-ons are created by Weebly themselves and others are created specifically for Weebly by third-party developers. Many are free such as contact forms and social media integrations. Others have a free trial or a basic free version along with a premium upgrade option to unlock more features. Some are premium only like Weebly Promote that costs $8 per month and allows you to add a form to your site to capture visitors details allowing you to market to them in the future. It’s important to browse the apps and look closely at the pricing before you go adding stuff. It’s not always easy to compare pricing for website builders as they rarely have like-for-like plans but hey, let’s give it a try, shall we? As we saw earlier, Weebly’s cheapest plan is $8 per month when you sign up for an annual plan as displayed on the main pricing page. Wix’s cheapest plan is only $5 per month on an annual plan but that only allows you to connect a domain name and you’ll still have to put up with the Wix ads. The most comparable plan is Wix’s $10 per month plan that gives you more storage space and allows you to remove the ads. When it comes to eCommerce specific plans, Weebly Business plan works out $7 more expensive than Wix’s eCommerce plan. The first thing to point out about Squarespace pricing is that they don’t offer a free website option whereas Weebly does so that’s an obvious advantage. Squrespaces’ cheapest plan (Personal) starts at $12 per month (annually). When it comes to eCommerce, there’s hardly anything in it as Squarespace’s’ basic online store plan costs $26 per month (billed annually) compared to to Weebly’s $25 per month (billed annually). As we can see, Weebly is right on par with it’s peers so really, you main concern should be to find the right website builders for you’re requirements as price isn’t a major factor. Conclusion – Which Plan is Right For You? It really depends on what you’re looking to create. First off, I’d recomend you start with the free trial to put Weebly through it’s paces and make sure it has everything you need. If it does, and you’re looking to create a simple business site or portfolio, go with either the Starter or Pro plan. If you’re looking to create a membership site then the Business plan which will give you everything you need but having said that, you could start with the Pro plan and upgrade later should you need to. If you’re serious about starting an online store, I recommend the Business plan as it has all the essential tools and features you need to do things properly and you won’t have to pay transaction fee’s on your sales. Then later on, if you require the more advanced tools, you could upgrade to Performance if you feel it would benefit you. 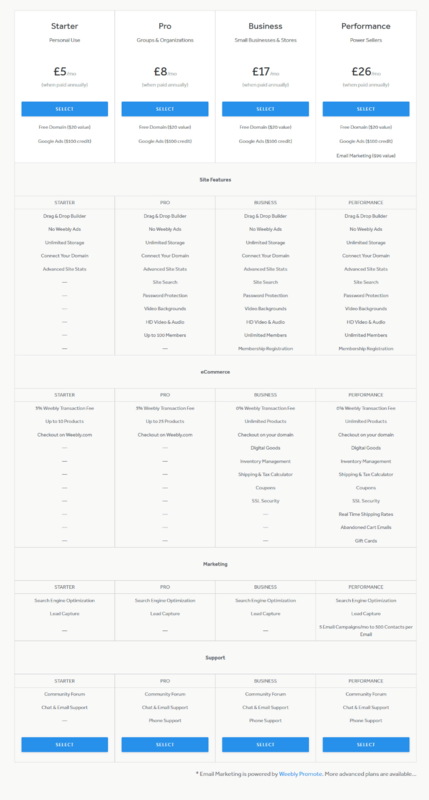 Have you made up your mind which Weebly plan is right for you? Maybe you still have questions? If so, let me know in the comments section below and I’ll do my level best to help you out! 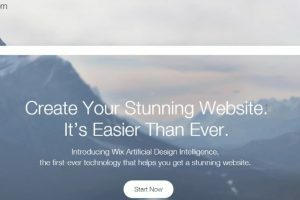 previous post: Wix ADI Review: Let’s Go Create a Site!